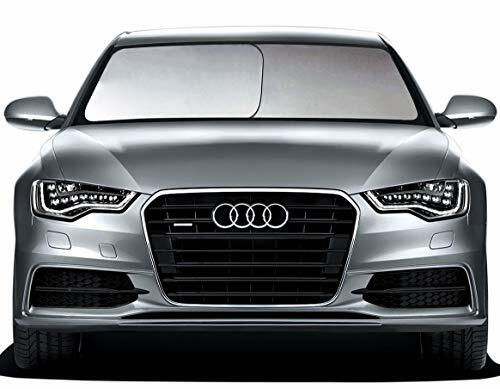 We spent time researching dozens of car sun shades, comparing them for durability, price, coverage, protection ability and much more and have determined that the EcoNour Car Windshield Sun Shade is our best overall pick. We have also added two more high quality car sun shades that were at the top of the list for all of the different points we looked at during our comparisons. The three reviews of these top rated car shun shades will allow you to learn more about each one to see why they are favorites and if they will work for your needs or not. Most people consider their cars a valuable possession that they want to take care of. Some people even treat their cars like members of the family and will do anything to make it run well and look fantastic. There is an often overlooked step that you can do to preserve the interior of your vehicle and dashboard; purchasing a quality car sun shade. Summertime heat can be brutal on the interior of your vehicle. UV rays can easily bake the inside and fade your upholstery and dash. Excessive heat can even cause the dash to crack. Sun shades are also known as windshield shades or car shades. These ingenious products protect the inside of your vehicle from damaging UV rays and the severe heat so your upholstery doesn’t suffer. The right car sun shade will keep your vehicle’s interior from getting ruined by extreme heat and UV damage. Car sun shades are super simple to set up and use but the benefits are huge. Not only will it protect the interior and keep your resale value up, it will also lower the temperature in your vehicle during the summertime and will help reduce super-hot steering wheels. Choosing the right car sun shade will help you take care of your vehicle’s dashboard and interior but with so many options on the market, choosing just one can be really difficult. The information below will help you understand the differences between good car sun shades and low quality sun shades. We have given you the tools you need to make a confident decision on the right car sun shade for your vehicle that will add style, protection, and value to your vehicle. We have also provided you with a buying guide that will give you the knowledge you need to sort through all of the available car sun shades. We’ll teach you what to look for in a high quality car sun shade, features they can offer, how to install them properly and much more. Have you ever gone out to your vehicle and opened the door in the summertime and are hit with a wave of hot air so hot it almost takes your breath away? It feels unbearable to climb into a vehicle this hot, not to mention the too hot to handle temperature of your steering wheel. The EcoNour car sun shade will protect your vehicle’s interior while helping to bring down the temperature in your vehicle from inferno to something a little more manageable. The EcoNour is easily set up. It can be popped open and folded back up in seconds which makes it easy to use every single day. When folded up it is small enough to fit right into the door pocket of the vehicle. The benefits to using an EcoNour sun shade are numerous including protecting your vehicle’s interior, electronics, and dashboard from massive UV damage and damage from the extreme heat. You won’t have to worry about cracked and peeling dashboards anymore with this sun shade installed. It is made from a quality polyester nylon material that is easy to wipe down to keep clean. It is lightweight, but very durable and long lasting. 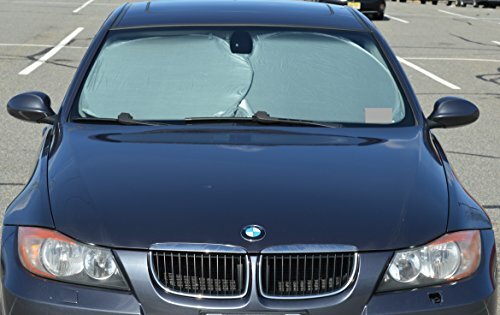 This car sun shade comes with its own storage pouch and can be installed in mere seconds. Ezyshade’s car sun shade provides vehicle owners with an easy-to-read size chart that will ensure that you choose the right size Ezyshade for your vehicle. This company’s shades come in two equal-sized rectangles so you get the perfect fit for your windshield. The sun shades can be installed horizontally or vertically and will block more than 99% of the UV rays that can get in and ruin your vehicle’s interior and dashboard. Another benefit to using the Ezyshade car sun shades is that it will lower the heat in your vehicle so you don’t have to get into a suffocatingly hot car or truck. The design of this sun shade is hassle-free and can be installed and folded up in minutes. Because of the two piece design, you can unfold and fold each piece while sitting in the vehicle with no struggles at all. The reflective material that is used to make these sun shades provides exceptional UV and heat protection for your vehicle. It also protects your electronics from overheating in a sizzling vehicle. Ezyshade ranked the best in internal heat reduction when compared to 15 other brands of lightweight, foldable sun shades. Each purchase of Ezyshade sun shades comes with 2 super reflective, adjustable sun shades, a storage pouch for easy storage, instructions on how to fold and use your sun shades, and a bonus sticky dashboard mat for your smaller electronics. A1 Shades brings you a universal sun shade for your windshield that will work with any vehicle whether you have a truck, SUV, van, or car. They offer vehicle owners a convenient and easy-to-use “Find Your Vehicle” chart that will help you find the right size sun shade for the vehicle you own. The design of this sun shade provides plenty of great coverage for your interior, protecting it and the dashboard from damage from UV rays and excessive heat. When not in use, this convenient and high quality sun shade can be easily folded up and stored away, taking up hardly any room at all. The two sides of the sun shade are connected by a fabric center that makes it very easy to install and take down. It is 100% sun proof and weather proof and will block out 99% of all UVB rays that can ruin your vehicle’s interior and lower you resale value. PLEASE NOTE: The use of car sun shades does NOT reduce the temperature in the vehicle enough to make it safe for children or pets to be left inside unattended and with no A/C o in the summertime. While it does improve the temperature and makes it lower, please never leave your children or pets in the vehicle unattended, with the windows up and vehicle’s AC not running. This is extremely dangerous for them and can lead to fatalities. 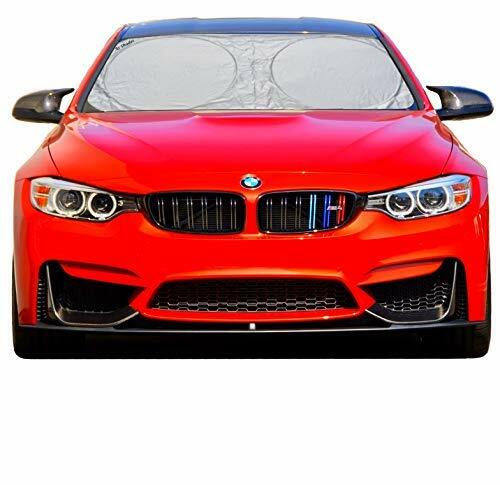 Going online and ordering the first car sun shade you find is a mistake that will result in getting one that won’t fit your vehicle properly and therefore won’t offer it the proper protection that a good fitting sun shade will provide. There are many different sizes and designs of sun shades on the market and it is important to know the size you need before you spend your money. Car sun shades are not the same thing as sun visors; a sun visor in the part in your vehicle that can lower to keep the sun out of their eyes. Sun visors offer the interior no protection at all from the heat and sun. A sun shade offers the protection you need to keep your interior seats and dashboard looking great. The research we have done and the comparisons we made when matching one sun shade against another have enabled us to bring the best of the best to you so you don’t have to search for them. Any one of the three top rated sun shades we reviewed above are great choices for the interior protection from the sun and heat that you are looking for. We have also listed a few other great quality sun shades that you can take a look at. There are many benefits to using car sun shades. The most important and significant benefit you will have is the protection of your interior upholstery, dashboard and electronics that are in your vehicle. During the summertime, the temperature inside your vehicle can skyrocket over 100 degrees F. This excessive heat combined with the sun’s burning rays is a recipe for disaster for the inside of your vehicle. In addition, it will make getting into your car during the summer much easier to tolerate as well because using sunshades will lower the temperature in your vehicle so it isn’t as miserable to get into it as it is when there is no protection. Sun shades do away with burning your hands on the steering wheel or seat belt buckles too. There are many different styles and designs of car sun shades to choose from. Below we have listed the most common styles and provided you with some information about each so you know the difference between the different ones you may be interested in. Roll-up Custom – Roll up sun shades that are custom-fit fold into panels when they are not in use. They are easy to fold and unfold and are designed to fit every inch of the windshield so your vehicle gets the maximum protection from the sun. A custom fit sun shade will cost a bit more but is still very economical. Universal Roll-Up –Universal roll up sun shades are a great style to choose when you are on a budget and are looking to find something to fit and provide the right amount of protection without worrying about a specific make and model. Universal roll up shades are affordable and fits a wide selection of vehicles. They can come in a large variety of colors, prints, and designs so you can have a lot of fun choosing one that reflects your personality. Accordion – If you are looking for a quality sun shade that is easy to store and that will provide the coverage you are looking for quickly, the Accordion style is a good choice. The accordion sun shade offers Universal fit so it will work with almost any vehicle on the road. It comes in different sizes that are designed for specific groups of vehicles such as SUVs, Vans, Sedans, etc. When sorting through all of the different styles, designs, and brands of car sun shades on the market there are several things that you want to look out for and ensure before you make a purchase. Don’t just choose the first sun shade you see. Consider the factors mentioned below so you will end up with the sun shade that will be the best for you and your vehicle. Budget – Everyone loves a good deal but there is a difference between a good deal and “cheap”. Don’t ever choose a sun shade simply because it is the cheapest one you can find. You get what you pay for when you purchase products so you should take other things into consideration as well when you are looking around. Materials – When determining whether a sun shade is good quality or not, look at the materials it is made with and how they are put together. You want a sun shade that is made with long lasting, quality materials that will easily do their job to protect your interior. Two popular, often used materials are polyester and nylon. They are affordable, long lasting, lightweight, and durable. They are also easy to keep clean. Sizes – When looking at the different sun shades available, look at the different sizes that each brand offers. Many companies have charts that give different size levels for their sun shades. The size of the sun shade will be determined by the size of the windshield. Some can be customized which ensures perfect coverage. Brand Name – The Company that your sun shade comes from is very important and should be something you check into. The reputation a company has can tell you a lot about the quality of the products they produce. Some brands have high prices but do a little homework on the company to ensure that the higher price is actually going to provide you with a quality product you will really be happy with. Design – Sometimes design matters a lot to vehicle owners and it doesn’t matter to others. There are a lot of different designs on the market to choose from so if you are one that likes to purchase things that are stylish and that enhance the look of your vehicle, all you have to do is see what selections the company offers and go from there. If there are color choices or print choices that will be listed in the description for you to select from. Easy-to-Use – Even though sun shades are not complicated to use, if it takes any time at all to install them in your windshield you may opt to leave it in the storage bag or pocket which defeats the purpose of buying it in the first place. Look for sun shades that are super easy to open and close and you won’t think twice about using it every time. Customer Reviews – If you have narrowed the choices down to a few and are having trouble deciding on one, you should take a look at the customer comments and reviews that have been left about the different sun shades. This will really help you get some idea of what the product is like and how it performs. Not all reviews can be trusted but if you are on Amazon and there are hundreds of reviews and the rating is high, you can be pretty confident that the product really is good. Reading customer comments will tell you things about the product that people may not typically notice which is always valuable information to have. Warranty – Even though most sun shades are inexpensive, many still come with warranties. Some have no warranties at all and others have lifetime replacement warranties which means if anything happens to your sun shade, it will be replaced whether 6 months have gone by or 6 years. Windshield sun shades are not usually difficult to install or take off. More have a wire like frame that holds its shape once opened so they stay in place inside the windshield. Some sun shades will have Velcro pieces or straps that help with solid installation. They are not usually difficult to operate and most packaging has instructions on it to follow for each individual brand of sun shade. Velcro can be a great help for securing the sun shade to the edges of the windshield. Not all shades fit perfectly for many reasons so it is always good to have a backup resource available in case there is a problem with fit or size. Some sun shades only use the rearview mirror to hold them up which can let more heat into the vehicle that is comfortable or necessary. The Velcro strips are a super easy way to get a secure fit without a lot of cost or hassle. Another great and easy thing to do with your sun shade is to fold it up when not in use. Most sun shades fold easily and it will amaze you when you see just how small they can get when folded. Some sun shades will not be able to be folded up small enough to go back into the original storage bag, but over all they are very easy to use and storage should never be a problem. There are many great things about car sun shades. If people knew the benefits they offer and how significant a difference they can make in the interior of your vehicle, everyone would make a point of getting them. They are excellent for protecting vehicles from heat and sun damage that can cause fading, cracking, and exceptional heat that is hard to bear in the summertime. With a sun shade, you will not experience summertime in your vehicle the same way again. Each brand and type may have its own set of features that it offers. Think about the features you are looking for a long with the type that appeals to you and go from there. Look for the sun shades that offer as many of the features you want as possible. You may find a brand that offers you everything you are looking for but if not; look for the ones that offer as many features as possible. All three of the top rated car sun shades that we have provided reviews for are great products made from quality materials and made by reputable companies that you can trust. The things we have brought to you in this guide along with the reviews are knowledge so you can sort through the different choices and determine which ones work the best for your vehicle. We have listed the most important things to look for when choosing a sun shade and have offered tips and suggestions on how to determine if the sun shades you are looking out falls into the right category for your needs. Remember not to choose your car sun shade on low price alone. Even the ones that are considered more expensive are not always a great product but if the company has a good relationship with the customers chances are the product will be an excellent on that you can share with whoever you want to. Don’t be opposed to studying the reviews and comments on the sun shades you are interested in. It will help seal the deal in terms of a decision that you can be confident about.